Top-notch questions ranging from arboreal creatures to the chief scientist of the Kaleds. The Picture Round is Negative Cartoons and the Wild Card is a stat on Eric the red! Q08. Where would you typically find an arboreal creature living? Q14. In 2004 which Swedish DJ spent five weeks at number one in the UK Charts with the song Call On Me? Q25. Safety, right guard and tight end are all positions in what sport? Q38. In Doctor Who, who was the chief scientist of the Kaleds who created the Daleks? 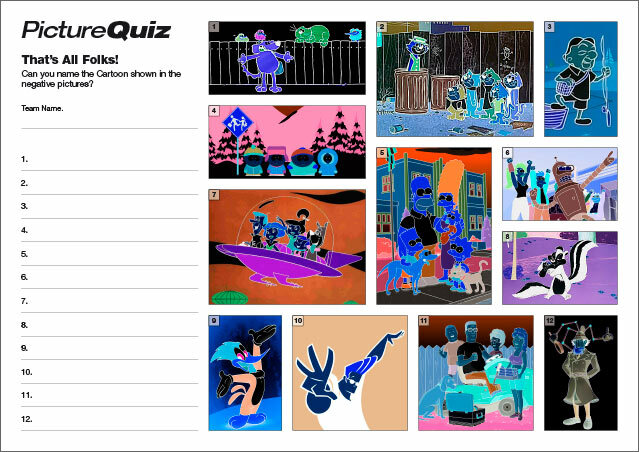 Here’s a low-res sample of the Negative Cartoons Picture Round, click for a higher resolution version. The Picture Round download is a two page high quality PDF with the answers on page 2. Quiz 046s Picture Round is can you name these Negative Cartoons? The Wild Card for Quiz 046 is a statistic on the Manchester United legend Eric Cantona.